Research in comics studies has gone a great distance toward defining comics as a medium, not a genre. Within the American context, comics as a medium was, for decades, conflated with comics as a genre, typically the superhero genre. In some ways, the scholar of wrestling studies might see such conflation as similar to the period in which wrestling and boxing were operated by the same promoters. The most significant initial investment was the ring, which could then hold both the sport of boxing and the entertainment of wrestling. The ring was a medium that could host two genres of performance. Comics scholars divided medium from genre by two lines of argument. The first line of argument proceeds by noting that comics have historically hosted many genres: superhero, yes, but also funny animal, teen humor, romance, science fiction, horror, autobiography, memoir, educational, and literary fiction and nonfiction. One medium, multiple genres. The second line of argument proceeds from analysis of how comics work as text. Neil Cohn describes the Visual Language of Comics: A language requires an interaction between three primary components: meaning, modality, and grammar. First, it combines the mapping of meaning to a modality. Spoken languages express meaning using the modality of phonology (sound), while visual languages use graphic structure (drawn lines). Systematic mappings between a modality and meanings create a stored lexicon. However, meaningful expressions alone—systematic or unsystematic—are not enough to become a language. Rather, those expressions must be ordered using a grammar. [“Visual Language Theory and the Scientific Study of Comics”] Comics constitute a system of meaning, modality and grammar, through which many kinds of stories may be told. So when I learned of Box Brown’s Andre the Giant, Life and Legend, my aca-fan wires crossed in a series of sparks. The ten year old who loved the larger-than-life heroes of superhero comics as much as he loved the larger-than-life heroes of the Avengers and Justice League shivered; this is the genre I love, exploring a figure close to my heart. The scholar in me wanted to see what this language, this deployment of meaning, modality and grammar, would look like — especially, what it could do that no other language could. Over the course of a few posts, I hope to explore these questions. The comic opens with a series of panels that use the relationship between the reader and the content to reframe readerly expectations. Cohn tells us to be aware of the ways that “independent components mutually interact to form the perception of a holistic experience” — in this case, an experience that moves us from focus on Hulk Hogan, arguably the most famous figure in professional wrestling for thirty year, to Andre. Hogan looms as a giant figure in the early panels, but diminishes in size until he is the same size as Andre, unnamed in the first panel. 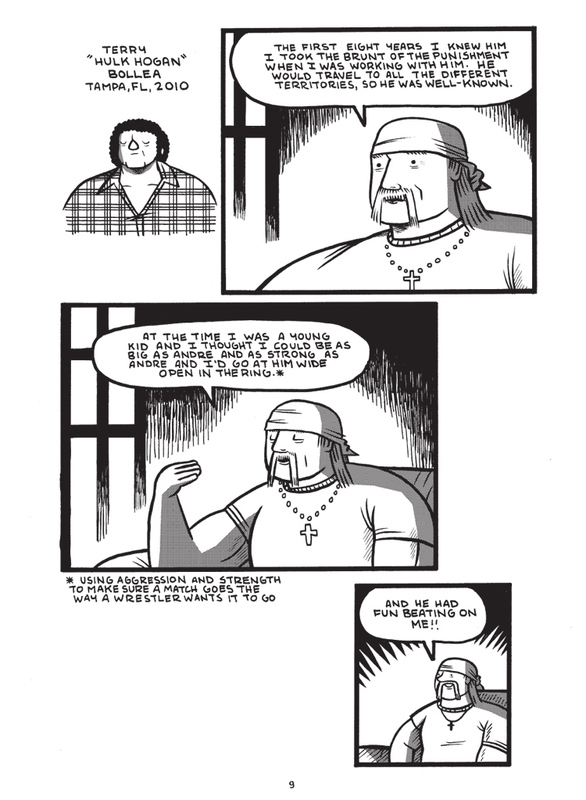 Box Brown uses Hogan to tell open Andre’s story, but Andre is still not… quite… visible. Most poignantly, in a series of panels on page thirteen, Andre exists only at a distance, his back to the audience.